For the next little while, you won’t see much of me here. I opened up my blog to guests—and a deluge hit. And how could I turn anyone down? Well, I couldn’t until I didn’t have any dates left. So, I’ll try to sneak in here and maybe post a note at the top of some fabulous author’s blog, just so you know the rumors of my demise are premature. 🙂 If you truly miss me, you can always find me on Facebook! I did reserve every Saturday for Snippet Saturday, so be watching for one-day-only giveaways from me on those days. In the meantime, here’s a contest to keep you going until the next opening I have for me to chat (other than a Saturday or a guest no-show)—February 26th. What can you win? 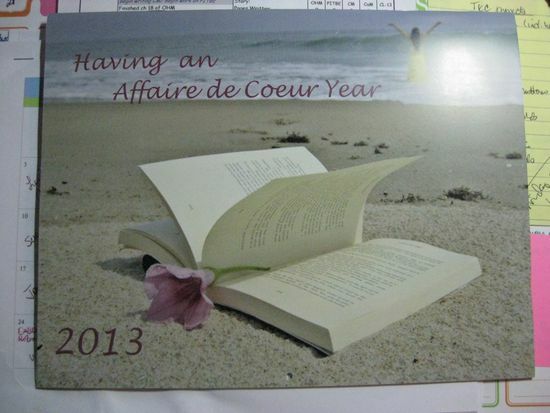 I have a stack of Affaire de Coeur magazine’s 2013 calendars. Each is filled with romantic goodness! I’ll start giving them away this weekend! And I won’t stop until I’ve given all of them away! What do you have to do to win? Simple. Comment on my blog. On any posting, from now thru February 26th. I’ll choose winners at random from among all the comments. Good luck!